So you’re determined to start kitesurfing, and you’re looking for the best approach for getting started. Most of the kitesurfers you’ve talked to have taken lessons, however, kitesurf schools can be quite pricey. Or, you’re just a DIY kind of person, you’ve done it before and think you can do it again for learning kitesurfing. Assuming you’re set on teaching yourself kitesurfing, let’s go through some life-saving points you’ll need to address before starting. But first, do you know what you’re up against? Are you aware of the dangers involved in kitesurfing? Getting overpowered: the wind is too strong in relation to your kite size, body weight, and flying skills. You mess up your launch or later lose control of your kite, get dragged down the beach, onto the rocks, out to sea (bad wind direction), or even inland into a building, a tree, or power lines. Your quick release system auto triggers (equipment failure): your kite rushes down the beach with the lines and the bar behind it, potentially hitting someone (e.g. a child) and the lines cut them like a knife. Flying mistakes: as you’re learning, you steer your kite too hard into the power zone, fall to the ground and get dragged out of control. You hang on to your bar, giving even more power to the kite. As you roll on the floor you catch your hands in the lines and get badly cut. Wind picks up unexpectedly: your kite is in the neutral zone but the weather changes and an upward wind stream lifts up your kite toward the sky. You don’t react fast enough and keep going up and up until at one point you just drop like a bag from a high altitude. You crash your kite in the water and are unable to relaunch. The wind is side-off or off-shore so your kite keeps dragging you parallel to or away from the shore. You try to trigger the quick release but your lines get tangled in your harness hook so you keep being dragged, at times with your head underwater. In the water, you kite suddenly deflates, or one of your lines snaps. As a result, your kite goes into crazy loops, making you lose all control and throwing you around you violently. You’re wearing a board leash so your board tends to whip back toward your head. With a minimum level of awareness, you can easily avoid these scenarios or quickly react appropriately to stay safe. Now let’s look at some of the most important things you’d need to stay safe while teaching yourself kitesurfing. Are you patient enough to read up on wind window, direction, speed and safety measures? Some DIYers are hands-on people who prefer doing vs reading. If you skip kite lessons, however, you’re missing out on essential information about wind direction, speed, and self-positioning in relation to it. Before doing anything with a kite, you imperatively have to understand how to determine where the wind is blowing from and how strong it is, which way to face and turn, and how your kite position and the steering you do will affect the behavior and power of the kite. Do you have access to a trainer kite to learn flying? If you’re going to do it alone, start with a trainer kite. These are much smaller and so bear much less risk than full-size power kites. A trainer kite can still drag you in the sand, but it’s not tied to your body (it’s handheld) and develops much less power. You can start with a 350 trainer kite for example. Make sure you have enough space to fly it without many people around you – e.g. a relatively empty beach, or a public park provided your local state regulation allows it. Also make sure to start on a day with light to moderate breeze, not strong gusty 25 knot winds! Explore the wind window, neutral and power zones with your trainer. Start drawing “8” shapes in the sky left and right, and learn to build up power and feel the drag. Can you count on reliable kiteboarding equipment? A major cause of kitesurfing accidents and emergency situations is equipment failure. 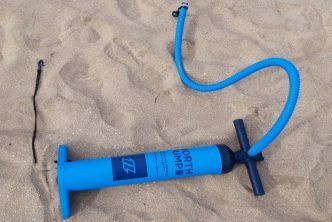 Kite bladders that lose air, lines that snap, chicken loops that snap or slip off, harnesses that break, all these can turn your sand or water session into a nightmare, particularly if the wind is strong. Many kitesurfing learners think they should get crappy equipment to learn on because it’s going to get abused a lot – kites will crash, lines will get tangled and caught on things, etc. Unreliable equipment, however, can add a lot of hazard to a learner’s experience – that’s why most kitesurf schools try to renew their gear every year. If you’re learning on your own, using a kite, kite lines and harness which are in decent shape, it will help reduce the risk of injury to you and any bystander. Check out my post on getting the right kite for a beginner. Do you have access to basic safety gear? If you lose control of your kite in strong wind while flying or relaunching, the lines can easily slash your head or face (or any limb for that matter). If you get dragged out of control upward or down the beach (see above accident scenarios), a helmet may save your life if you hit a rock, a wall, a tree, a car, or crash onto the ground. If you’re not sure about what to get for safety vest or helmet, my recommended safety gear page can give you a good starting point. By the way, if you’re learning kitesurfing on your own, please DO NOT use a board leash without wearing a helmet! If you don’t wear a helmet, take the leash out, you can always body drag to recover your board. One more thing: I strongly advise you get a line cutter, a small tool with a blade that can save your life if your lines get tangled up in your harness, your board, some rocks etc. Harnesses typically have a small line cutter pocket to stash it in. Make sure to get familiar with taking it out (e.g. while under water). Can you ask a kitesurfer friend to spot you? I know what you’re thinking: if I had a kitesurfer friend to teach me, then I would no longer be teaching myself, would I? That would be the same as taking lessons. What I’m talking about here is just asking a kitesurfer friend to come and spend a half hour with you on the beach to help you launch and land your kite, and give you a few pointers. If you’re still learning to pilot your power kite, he/she can grab you by the harness handle to help you fight traction and learn to better lean back against the wind. Your friend will also help point out your most obvious mistakes, such as pulling down the bar at the wrong time or waiting too long before steering back up as your kite is heading downward. That’s not typically too much to ask from a friend, and it’s usually something kitesurfers find pleasant and amusing – I’d gladly spend some time on the beach with a learning friend to give them some pointers. Teaching them to kitesurf from scratch, on the other hand, would involve excessive commitment and responsibility. Do you have access to a safe spot with decent conditions? Plenty of space, no crowds. To launch your kite, you need an empty area around you with a radius of at least 25 m (the length of your lines), and additional free space downwind from you in case you crash your kite. 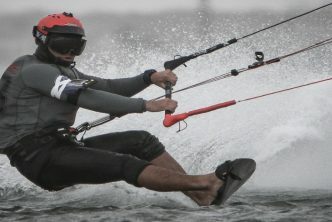 Your lines are like razors at high speed, you don’t want to cut anyone’s ear or throat during an unexpected kite loop. No nearby buildings, electric lines, cars, rocks… Expect anything to happen, and plan for enough clearance downwind from you. If there’s a building downwind, take your stuff and walk further where there isn’t! If you’re at the water start stage: a beach (or lake) with as little surf and current as possible, a sandy bottom, and if possible shallow enough to walk even a few yards from the shore. Onshore (blows toward the beach) or sideshore (parallel to the beach) wind with medium speed – too weak or too strong can make your learning much harder. Imagine you might get dragged downwind helplessly by your kite for a long time, and try to envision where you’d end up exiting the water if that happened. If possible, try to arrange for someone with a boat or jetski to keep an eye on you and come to rescue you in case of emergency, particularly if the wind is offshore. You may really thank yourself later for doing this. Is teaching yourself kitesurfing worth it? So is it all worth it? If your goal is to save money, probably not. You’ll still have the cost of getting a trainer kite and the kitesurfing equipment you’ll learn on. Of course, you may have some equipment available to you at little or no cost (e.g. friends). But even assuming it’s in good enough state to make it safe, chances are you’re going to abuse it quite a bit while you’re learning, and may have to replace it for the person you borrowed it from. If you choose the lessons path, on the other hand, the school’s equipment will be the one to take the beating instead, so that’s savings right there. But the most significant potential cost of learning kitesurfing on your own is in hospital bills and possible lawsuits for injuring yourself or someone else – these could even last for a lifetime. If you learn through a kitesurfing school, you’ll normally be covered by their insurance. If you go it alone, though, consider purchasing insurance yourself. Another side consequence of causing an accident on yourself or someone else is that it may lead to authorities closing the beach to kitesurfing, something that will really upset the local kitesurfers and get you banned for it! If like me, you’re the self-learning type, my advice to you is to still start with a few lessons to cover the most important aspects from a safety standpoint – even though you may only take lessons for some key parts of the full learning process. Start by reading up on basic wind theory, check out some Youtube videos, then get your hands on a trainer kite and get familiar with steering, window positioning, and traction without any risk. Then, book a few lessons in a good kitesurf school to learn how to set up your power kite and lines in a bulletproof way, how to launch and land the kite (lots of accidents there), how to trigger the quick release, what to do if you kite crashes, how to control your kite with one hand, how to body drag and relaunch, and how to water start. If you’re a smart learner, you should be able to get these steps down in 4 to 5 hours of instruction, and then freely move on to more self-learning.